Why choose a mobile containerised wastewater treatment system for your drilling rig or worker camp? Mobile containerised wastewater treatment systems have a huge advantage for both the offshore and onshore oil and gas exploration industry. Conventional wastewater treatment plants do not offer a flexible solution for applications like this. The only choice for mobile sewage treatment plants for worker camps and drilling rigs is a containerised wastewater treatment plant. A containerised sewage system has all the components needed for wastewater treatment all preinstalled in ISO sea containers. These include containerised wastewater screens for primary treatment, containerised sludge storage tanks, containerised biological reactors and containerised clarifiers. All the mechanical controls are also housed in a sea container. These containerised wastewater treatment systems are factory assembled, loaded for transport, and shipped to any location worldwide. 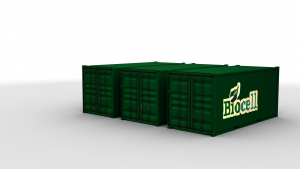 The containerized wastewater treatment units can then be transported via road transport to any onshore location regardless of how remote, or they can be shipped to offshore facilities. Containerized mobile sewage treatment plants have a major advantage as they can be loaded onto trucks and relocated as drilling locations change or as a worker camp migrates. Systems are totally modular, so if the number of workers increases or decreases, additional containerised modules can be added or removed from the system. Mobile containerised wastewater treatment plants can cater for any number of workers, from 20 – 5000 persons. Biocell containerised wastewater treatment plants are manufactured using only CE marked components and equipment that are specifically suited to harsh environments such as deserts. Low quality and low-cost mobile wastewater treatment systems often compromise on the quality of the components or are not fully automatic, resulting in downtime and costly maintenance and replacement parts. Biocell mobile wastewater treatment systems are fully automatic with minimal operator input required. Our mobile containerised wastewater treatment plants can incorporate Water recycling and reuse in all models, allowing the treated effluent to be recycled for use elsewhere onsite. Due to the flexibility and modular nature of containerised wastewater treatment plants, they offer a cost-effective method of wastewater and sewage treatment for offshore exploration. If a wastewater treatment system is needed, one can be manufactured and mobilised to site in a matter of weeks. If additional capacity is needed for extra staff, no problem. Again, a containerised wastewater treatment plant can be shipped immediately to the rig and connected into the existing infrastructure immediately. ATEX rated wastewater treatment plants can also be supplied as standard. As all the system components are preinstalled into sea containers, they are ideally suited to the harsh marine environments. Biocell mobile wastewater treatment plants offer fully automatic operation, no downtime for maintenance and minimal operator input. If you are looking for a mobile containerized wastewater treatment plant with water reuse then our optional water reuse module can be supplied as standard. Where mobile worker camps or offshore facilities will only be operating for short periods of time, containerised mobile sewage treatment plants are available for lease or purchase. Leasing or renting a sewage treatment plant can offer a very cost-effective and simple method of providing high-quality wastewater treatment infrastructure onsite. Leasing a mobile wastewater treatment plant also allows for ultimate flexibility, as modules can be added or removed as staff numbers vary. Regardless of your location, Biocell Water offers site visits to assist with positioning, setup and training for your mobile wastewater treatment plants. This gives all our customer’s total reassurance. We can provide any level of service, ranging from on-going remote monitoring, operation and maintenance, to basic support depending on budget and requirements. All parts used in Biocell containerised wastewater treatment systems are of the highest quality and CE marked. However, all spare parts and components are kept in stock our service hubs. If a part is needed, we can get them delivered to most locations globally with our premium service air delivery. Alternatively, we can offer to supply a full schedule of wearing and replacement parts with any order, so parts are immediately accessible. If you are looking for an experienced, professional and certified service partner for the supply of mobile wastewater treatment plants and containerised wastewater treatment plants then contact us now for a cost of a mobile sewage treatment plant.